We have just been asked by micro-scooters to review one of their Maxi Micro Scooters. 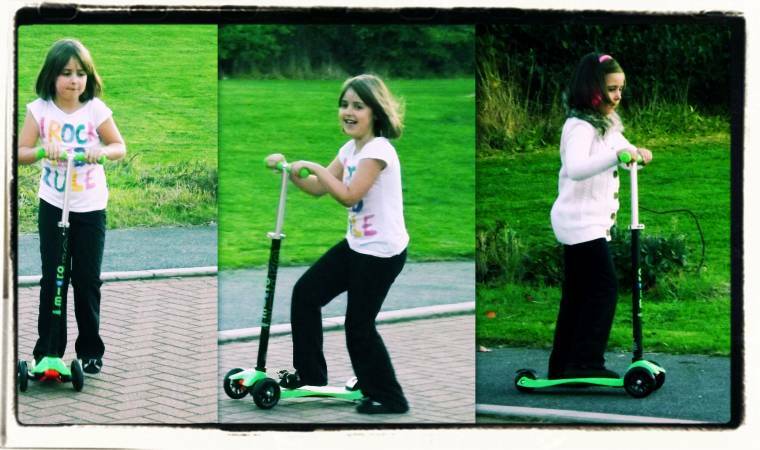 The company run by two mums who have made scootering to school popular nationwide. They have scooters to suit every age group from three years and up – right through to adults who want to join their children on the school run or even commute to work. The ladies now work with the original Swiss company who developed Micro Scooters and advise them on ideas particularly for pre-schoolers.The scooter I picked to review is the Maxi Micro Limited Edition lime green t-bar. 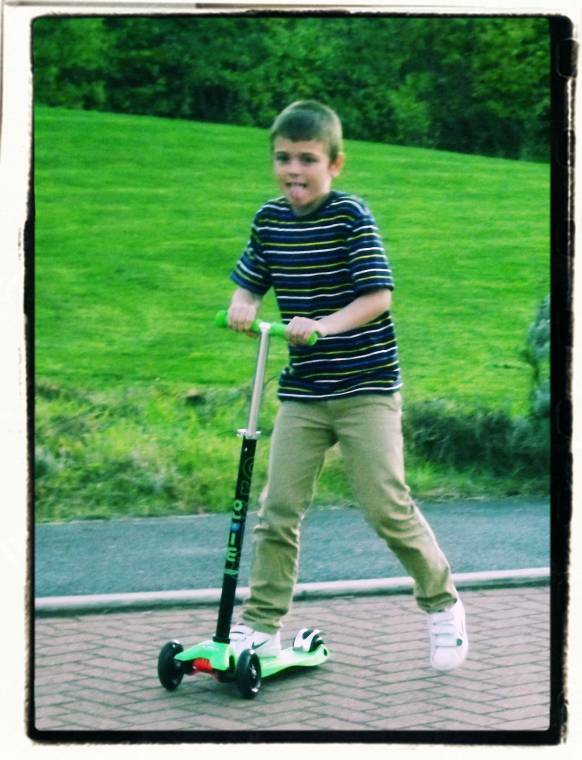 My two eldest children used to love their scooters when they were younger.As their riding skills advanced the scooters became limited and they went for BMX bikes instead. Because of that with my two youngest I have stayed away from buying scooters as I thought they would soon grow out of them. So I was very surprised after a few years out of buying scooters how they have come on. The amount of styles and features now available is simply amazing.None of my children have tried any like this before. My little two have only seen the standard style and the ones with the 3 wheels (2 at the back) so they were very surprised at the style of this one. I loved the look of the green scooter and was intrigued by the scooter having two front wheels, with the T-bar turning handlebars. I was expecting my 8 year old son to go mad for this one, yet my daredevil daughter was the first to want to go on it, indeed it was difficult to get her off!!. Even my 14 year old son was impressed sneaking a quick blast in between drink breaks. The critisism my elder children had when they had their scooters was the difficulty in turning, steering, other than in a straight line. You had to lift the front wheel to turn risking accident to make the scooter move at an angle. Or worse still veer hard one way which nearly always resulted in a crash. 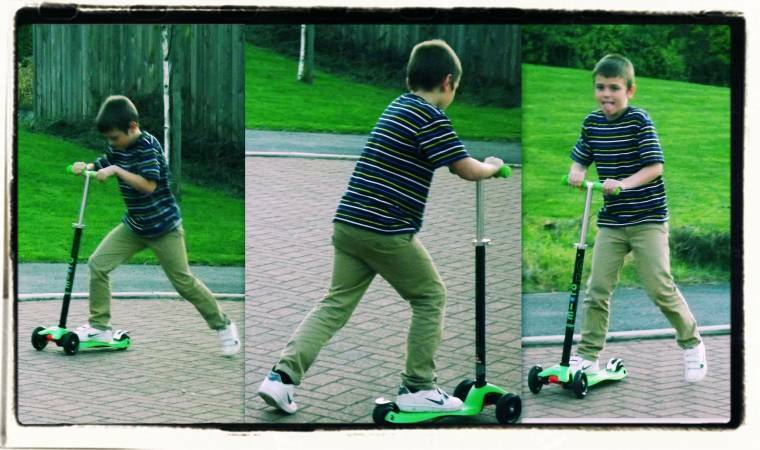 As the children practised on this scooter you could see how the front steering sorted this problem out, you lean the T-Bar left or right and the wheels move with you so you can snake along the paths as you go. This feature which I had never seen before takes the scooter from a straight line toy to a urban vehicle. It really does alter how you use the scooter and what you can do with it. Brilliant development. My elder sons were very impressed with this, commenting that they would have like this feature years ago. I was very pleased with how easy the scooter was to set up everything just clicked into place it took just a few minutes from opening the box to getting the scooter onto the pavement. The delivery was super speedy and packed in just its original box (with thin grey bag to keep from prying eyes) making a more eco friendly delivery. We have had many things delivered over the years most of it is over packaged, so this was a nice change. For children age 6-12 years. Also available in pink ,purple and black. Ideal follow on from the mini Micro. Low to the ground and robust. Available for a limited period only…. They have the largest range of Micro Scooters in the UK. The website is great and you can buy everything you would also need with the Micro Scooter from helmets for safety to bottle-holders. One thing I have always thought was bad about scooters in the past is if something breaks then that’s it they end up being put into the shed and never getting used but the great thing about buying from Micro Scooter is that if anything thing should happen to your Scooter they have a Youtube channel on how to mend and replace parts for it.And they sell Spare parts. 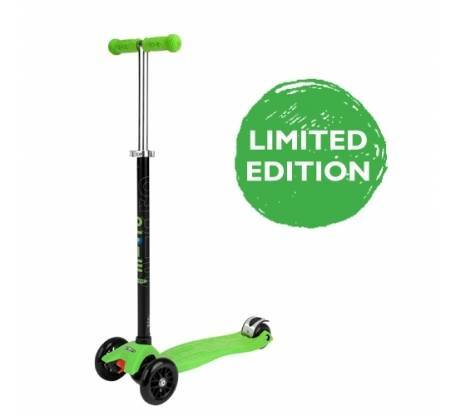 This Maxi Micro Scooter is priced at £99-95 at first I thought it was a lot of money for a scooter,certainly going back to when we bought them years ago,it seems pricey. When you see what it can do in comparism to the early scooters its like night and day, so taking that into account I believe the price is actually good value for money.The feature set is a world away from the early scooters, and as the children develop their riding skills the scooters now are good enough to do what they want rather than hold them back. The plastic is tough and hard wearing and if something does eventually break you will be able to get it fixed. Look on Youtube at the steering capability this to me is what makes the scooter worth its money. As it is now a genuine alternative to a bike, rather than a novelty toy like a space hooper or pogo stick. The steering is a little different to a standard scooter so takes time to pick up how to use it. My children were pre programed to want to do the basics and were shocked how it could snake along. 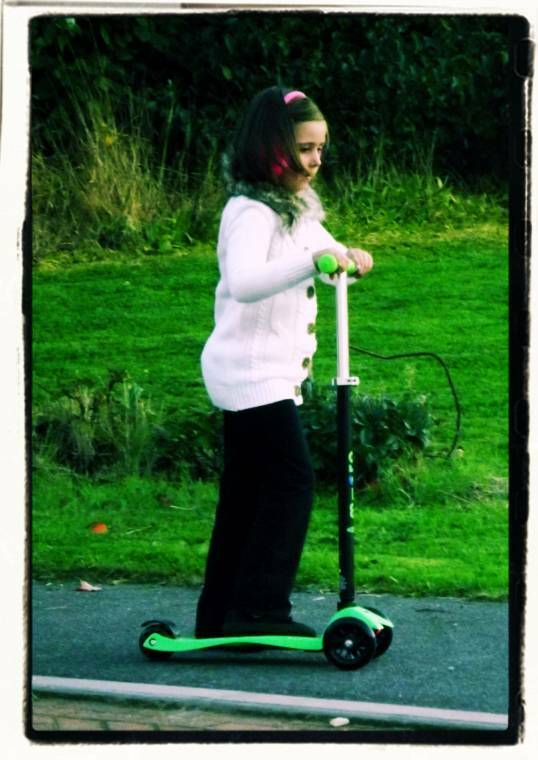 My daughter got it straight away but my son seemed to think about it more.Overall they really liked the scooter and hopefully my daughter will learn to share it, but then again I’m thinking she would love one in pink off santa…. My husband was very impressed as he has been considering the adult version for the commute to the train. He currently uses a fold up bike but has seen lots of men on the adult scooters. Not too sure if he thinks hes too old or not we shall see! I was sent this scooter for free in return of a honest review and all thought’s on this are my own and I was not paid for this review…..
"Music Mondays #Week 2: The Scientist"
"Christmas Childrens-Wear For 2011 At Matalan…"
I bought a microscooter when I was in my first year at Uni for travelling to and from my summer job at a hotel (otherwise it was a 40 minute walk)- it really saved me time although my issue was that I got RSI in my right ankle as I couldn't do it with my other leg so I actually had to give up doing it after 5 weeks! It was very useful though. I wasn't so hot on the steering! It's interesting to see how they have developed their range 10 years on! Several years ago the kids scooter began forming a trend and there has been no looking back. Kids scooters are great for helping your children get out and about and meet other kids. Wow its such a fantastic post about Maxi Micro Scooter. According this post this types of scooters are not more expensive. I read this post its very nicely describe about Maxi Micro Scooter.